One of the most popular country/honky-tonk acts of the 1990's has been Brooks and Dunn, the best-selling country duo of all time. Kix Brooks hails from Shreveport, La., and was a successful country songwriter and solo performer before forming Brooks and Dunn; Ronnie Dunn, originally from Coleman, Texas, was a solo artist during the early 1980's but came to Nashville in 1990 after winning a talent contest. After meeting at their publishing house, Brooks and Dunn began performing together, scoring up their first hit in 1990 with "Brand New Man," the title track from their first album. "Brand New Man" went on to spawn four #1 hits "Brand New Man," "My Next Broken Heart," "Neon Moon," and "Boot Scootin' Boogie," a country music first, and sold millions of copies. 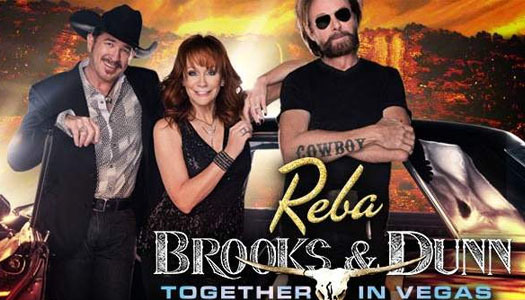 Brooks and Dunn team together with Reba McEntire for a fantastic show filled with their biggest hits during this Las Vegas residency at the Colosseum at Caesare Palace.